The Model 280 and 281 General Purpose Plug-In Relays are heavy duty, high quality relays available at a competitive price. UL Recognized and CSA approved, the Model 280 and 281 have a long life of over 10 million mechanical operations. 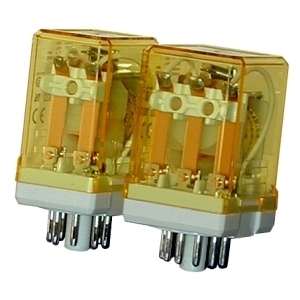 Model 280 and 281 relays are available in a variety of AC and DC voltages. Mounting configurations are standard 8- and 11-pin. The Model 51X120 8-Pin Socket is a surface or DIN-rail mount octal socket which is suitable for use with Time Mark relays up to 480VAC. The thermoplastic body can withstand up to 300 degrees F continuously without melting or electrical breakdown. Terminals are #6-32 screws. The one-piece, molded body does not require a separate insulator strip. UL Recognized file number E-126447, CSA Certification file number LR-29513-27M.